I just got home to find my new pencils had been delivered. 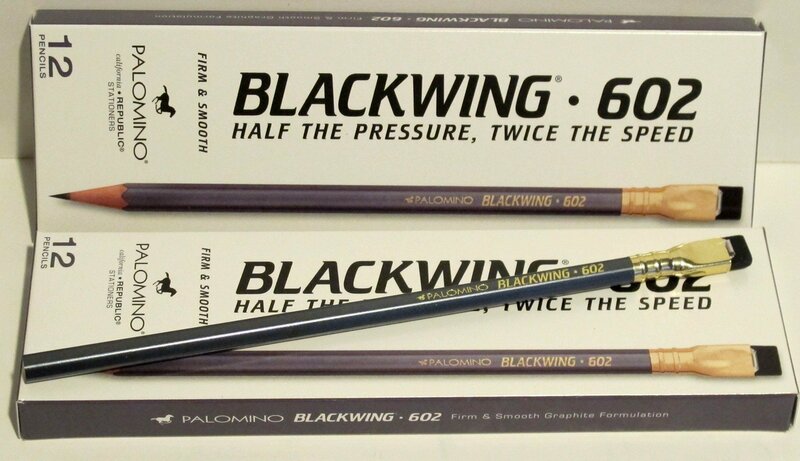 Palomino’s Blackwing 602 is highly recommended by Mark Frauenfelder at boingboing.net as being The Most Wonderful Pencil In The World. Well, at least his pencil of choice. I have been writing with whatever pencils I’ve found in the desk, and except for the last few “Write!” pencils given to me over a decade ago by my wonderful friend, Joy, I haven’t been really pleased with any of them. I sharpened the first one with my manual sharpener, originally bought to be used with my art pencils, and then gave a little test scribble across a scrap piece of paper on my desk. It felt like the lead was almost hydroplaning across the surface of the page. I made everyone in the house give it a try and then we tried to figure out what hardness the lead might be. I did a quick search and found the answer at penciltalk.org. (Who knew there was an entire website devoted to talking about pencils??). According to the post, the lead is rated at a hardness level of 4B, but with an increased wax content that allows for the smoother flow in writing, and reducing the crumbling and smearing normally found in that soft a lead. I am very excited to see how well it works during tomorrow morning’s journaling/writing session.